Elena Elkhorn learns that her father, the groundskeeper for the crumbling Willows estate, has gone missing, so she sets off to find out what happened to him. When she reaches the estate she quickly learns that there is more to the crumbling mansion and its gardens than meets the eye, and that the amulet she wears around her neck is far more than a family heirloom. The veil between the world of the dead and the world of the living is very thin at the Willows estate, and Elena's amulet lets her pierce that veil and assume a ghost-like astral form which gives her both the ability to possess physical objects and to communicate with the spirits of the dead. And there are a lot of spirits of the dead at the Willows estate, and they all seem to have left this world through unseemly demises. 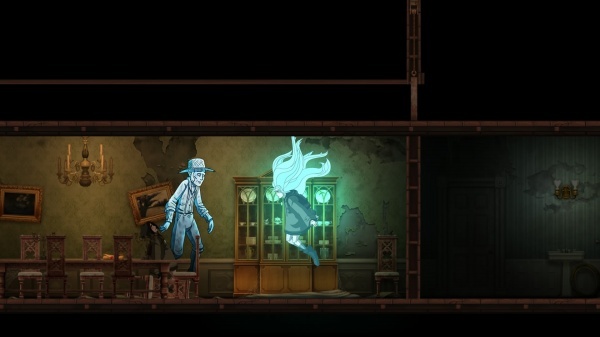 The gameplay in Whispering Willows takes the form of a side-scrolling adventure game. Elena navigates the world in two dimensions, with the world broken into different areas separated by doors and gateways. Interactive items are flagged by large white text that appears on the screen as Elena passes them, so there's no real way to see them until you've found them and you need to play attention not to miss the text because it will disappear as you move past the item. Most items simply elicit a one or two sentence observation from Elena, but some need to be collected to make progress in the game. The items don't need to be managed, combined, or manipulated in the sorts of ways that are common with inventory items in traditional adventure games. Most of the time you will have only a single item in your possession, and merely possessing the item when it is needed is all that is necessary to get past a roadblock in the story - I hesitate to use the word 'puzzle' because there's no thought involved in the process. Sometimes your progress through the physical world will be blocked and you'll need Elena to assume her astral form to proceed. It's not at all difficult to determine when and how this needs to be done - if you see a small crack in the wall of ceiling with a feint blue glow about it, it's time to turn spectral and float your way through. Once through it's always obvious what object, be it a switch or something similar, you'll need to possess and move to allow Elena through. While ethereal you'll also be able to communicate with the ghosts of the estate, learning both the reason each ghost still haunts the estate as well as some of the estate's sordid history. The ghosts usually require you to return an item to them, helping each one reach some sort of closure with its death and freeing it to move on to the next world. There are some evil spirits about the estate as well, and when Elena is near one her amulet will glow red. These spirits can kill Elena, but it's a rather simple matter to avoid them, and there are very few of them in the game to worry about. Conversations with ghosts, along with the notes that you'll find scattered around the estate, will help you to eventually piece together the real history of the estate and how it was built upon the genocide of a local native tribe. This history really forms the bulk of the story in the game, so how much you'll get out of the game from a narrative perspective depends on how willing you are to read through all of the notes. Whispering Willows has a nice art style and makes excellent use of sound in creating a creepy atmosphere. However, there is absolutely no challenge to the gameplay and you can easily run through the game in a single evening. In fact, if it weren't for some forced backtracking and a garden "maze" that will force you to remember in which order you went through the various passageways, the game would be even shorter. It's less a game and more of an interactive story in which there's no room to deviate from the set narrative. Don't let its ease of play fool you into thinking that it would make for a good children's game, though. The ghosts left this world violently and that violence is reflected in their spectral appearance - and one of the ghosts is a small child who was bludgeoned to death. If you want to kill an evening with an interactive graphic novel, then Whispering Willows will fit the bill. On the other hand, if you're looking for even the least bit of challenge, you won't find it here. Final Rating: 60% - Whispering Willows has you guiding a story along more than actually playing a game.